Lower prices here in the share price can be seen as an opportunity. Compounding occurs faster in a portfolio when one can buy more shares. For the time being, we remain long. Shares of Cardinal Health, Inc. (CAH) continue to struggle. The share price closed well under $47 on the 16th of this month. We have been long this stock for some time now and have been re-investing the generous dividend on offer in order to reduce our initial investment. 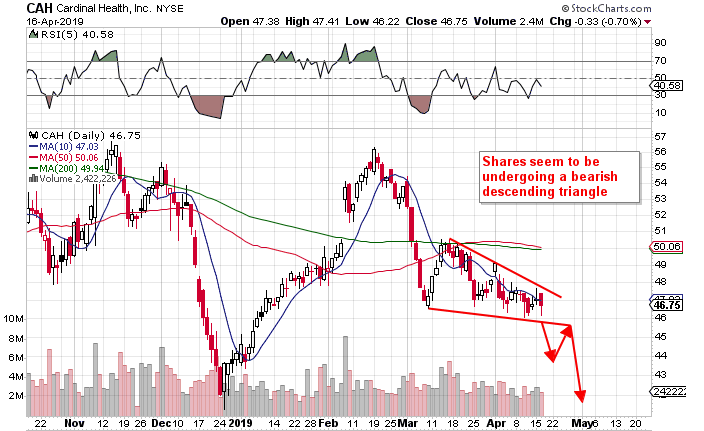 If we look at the chart, we can see the shares seem to be undergoing a descending triangle. These patterns are usually bearish patterns as the pattern of lower lows and lower highs usually mean that sellers are in control. To complete this pattern, shares would need to break below the lower trend-line on elevated selling volume. If the above scenario was to play out, there are two ways one could view a long investment here. Firstly, technical traders, one would feel, would liquidate positions if the April lows were not to hold. It stands to reasons to believe that the December lows could come under pressure quickly if we had a spike in selling volume on a close below that lower trend line. However long-term investors may feel a spike lower in the share price may present an opportunity. Why? Well, Cardinal Health has increased its dividend consecutively since 1987. Cardinal currently pays out almost a 4% yield which would increase even more on a down-move in the share price. Therefore, from that standpoint, let's research the dividend to see if it is stable and whether it could continue to grow through a sustained downturn. For long-term dividend investors, growth is an important factor for a number of reasons. The most important reason is that dividend growth protects against inflation. For example, if the inflation rate was running at 3% per year, any increase under this would mean that the investor would be actually losing purchasing power on his or her investment. The second reason is that investors can get paid through the dividend when a company grows its earnings consistently. Firms which look after their shareholders usually increase their dividend more when the earnings growth is there to cover it. With respect to the growth numbers, dividend growth has been slowing at Cardinal over the past few years. The 5-year annual average growth rate of almost 10% has dropped to just over 3% over the past 12 months. The reason here is negative earnings growth with operating profit having fallen from $2.2 billion in 2015 to a current $1.7 billion over a trailing 12-month average. Despite the negative earnings trend, Cardinal still generated $1.7 billion of free cash flow over the past four quarters. Affordability is not the issue here as $578 million was paid out in dividends over the same time period. The encouraging trend we see in Cardinal at present is that earnings projections have been slowly creeping up for this present fiscal year (which ends in June). Analysts who follow this stock expect the distributor to do $5.09 in earnings per share this year followed by $5.37 the following year. Ultimately, these positive projections are expected to result in an average 5-year growth rate of about 6% going forward. The debt to equity and interest coverage ratios are key metrics which can give insights on whether the dividend can take advantage of sustained earnings growth. We do not have an accurate number for the company's interest coverage ratio (in its most recent annual report) due to the $1.4 billion impairment charge on the income statement. Interest expense came in at $329 million last year which would have been easily covered though by operating profit but for that large impairment charge. Total liabilities came in at just under $34 billion in 2018 which led to just over $6 billion of shareholders' equity. The trend here is rising so this key metric will have to be watched closely as too much debt can definitely impede dividend growth even in an environment of strong earnings growth. At present though given the firm's valuation and expected earnings growth, we do not see any significant reasons to bail at present (as this will end up being a long-term play). What we may do is reinvest the dividend elsewhere if dividend growth rates remain sluggish. Shorter-term investors should be wary of lower prices in the near term. Those December lows now look like they will be tested. Elevation Code's blueprint is simple. To relentlessly be on the hunt for attractive setups through value plays, swing plays or volatility plays. Trading a wide range of strategies gives us massive diversification which is key. We started with $100k. The portfolio will not stop until it reaches $1 million. Disclosure: I am/we are long CAH. I wrote this article myself, and it expresses my own opinions. I am not receiving compensation for it (other than from Seeking Alpha). I have no business relationship with any company whose stock is mentioned in this article.